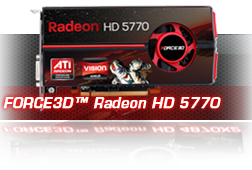 ATI Radeon™ HD 5800 Series graphics processors are the most technologically advanced and feature rich GPUs AMD has ever created. 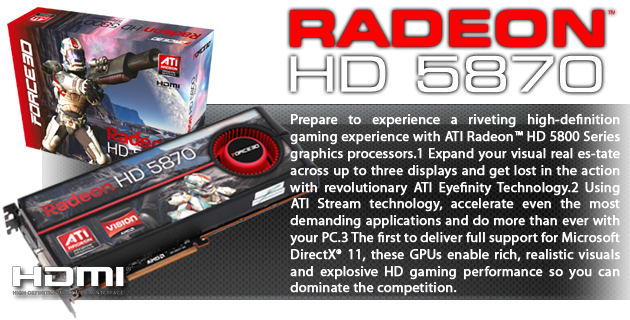 Prepare to experience a riveting high-definition gaming experience with ATI Radeon™ HD 5800 Series graphics processors.1 Expand your visual real es-tate across up to three displays and get lost in the action with revolutionary ATI Eyefinity Technology.2 Using ATI Stream technology, accelerate even the most demanding applications and do more than ever with your PC.3 The first to deliver full support for Microsoft DirectX® 11, these GPUs enable rich, realistic visuals and explosive HD gaming performance so you can dominate the competition. Get a truly immersive entertainment (gaming and video) experience and help boost productivity (home and office) with ATI Eyefinity Technology, extreme multi-monitor support. 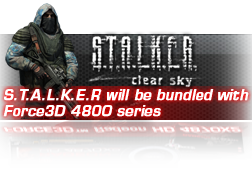 Expand your field of view across up to three displays and see more detail than ever before with innovative ‘wrap around’ capabilities that deliver an incredibly intense gaming experience, enhancing the feeling of being IN the game. 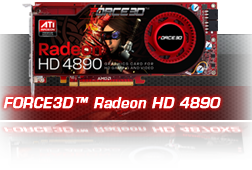 This modular solution gives you the freedom and flexibility to add more displays to upgrade your system when you want to. applications and help increase productivity.